The siblings’ mother, Susanna Owens, hoping to escape magic, married and moved away from her sister Isabelle (who, on the other hand, embraced her inner witch, and now keeps the family home and Book of Shadows, both which are to be inherited by the strongest witch of each generation). But when Franny turns 13, she is invited to meet her aunt. Reluctantly, their mother not only allows her to leave for the summer, but allows Jet and Vincent to go as well. That summer vacation is just the beginning of their understanding of their true selves, and sets in motion the course of the rest of their lives. “Forgetting her loss would be worse than the loss itself.” (231). The first few chapters of the book deal with the children’s questions of their heritage. In this way, Hoffman addresses the idea of memory as a tool for understanding the self. (Forgotten memories not passed down through family generations, secrets, betrayals). Hoffman uses a few established historical references to the Salem Witch Trials (like John Hathorne, the vicious trial judge for the town of Salem, for example) to ground the tale in fact rather than fiction. By writing the story around an already well-known historical event, Hoffman brings credibility to the witches ancestry. Through the lives of the Owens’es, this book touches on the idea of forgiveness as a tool for healing and self-acceptance. I have personally traced my own family tree far enough back to find an accused Salem Witch in my own heritage. 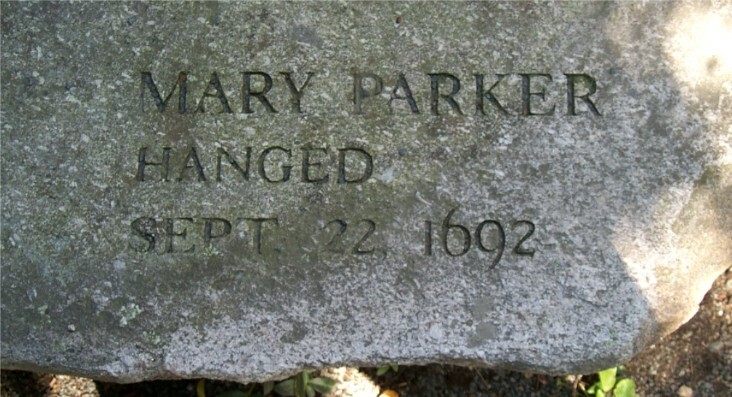 Mary Ayer-Parker, who was hanged in 1692 as an accused witch, is my aunt of husband of 1st cousin 10x removed. So, for me, this story, despite being a fiction, is very near and dear to my own heart. Because it could be real enough, and, at least, the history is: it is clear that Hoffman has done expert research in the writing of this book. “He carried the burden of his family with him and was weighed down by the wrong they’d done in the world.” (312). It’s startling to take stock of how of a piece this book feels with its predecessor, of what a complicated dance of interlocking nostalgias this book explores and provokes: Circles close within circles and spiral out again, and there’s a magic in that too. The book also deals with the theme of knowing oneself, or finding the self, and being true to yourself. “He understood who he was.” (53). The siblings are not ‘normal’; Hoffman’s tale of these witches coming into their own can offer advice for everyone struggling with their individuality. “We’re bloodline witches. Which means we have no choice in the matter. It’s a genetic factor. Like blue eyes or red hair. It’s who you are.” (41). Her most recent novels have received many accolades, and are New York Times bestsellers. They include The Museum of Extraordinary Things, The Marriage of Opposites, and Faithful. Her newest novel, The Rules of Magic, is the prequel to her cult-classic Practical Magic. It was selected as a LibraryReads and IndieNext List Pick for October 2017 and is one of the Most Anticipated Books on iTunes. 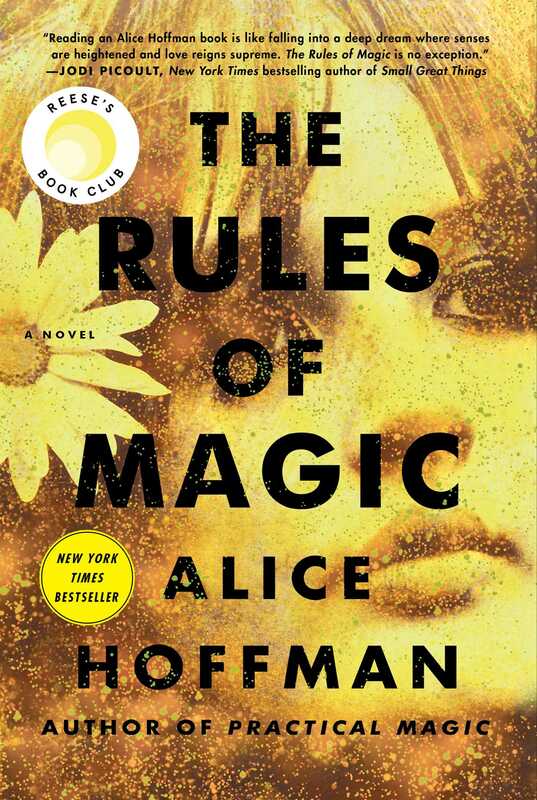 Reese Witherspoon picked it as her October 2017 Book Club read, remarking that the “story is full of magic, love, family, heartbreak and redemption.” Set in New York City at the cusp of the sixties, The Rules of Magic is a timeless story that reminds us that the only remedy for being human is to be true to yourself. 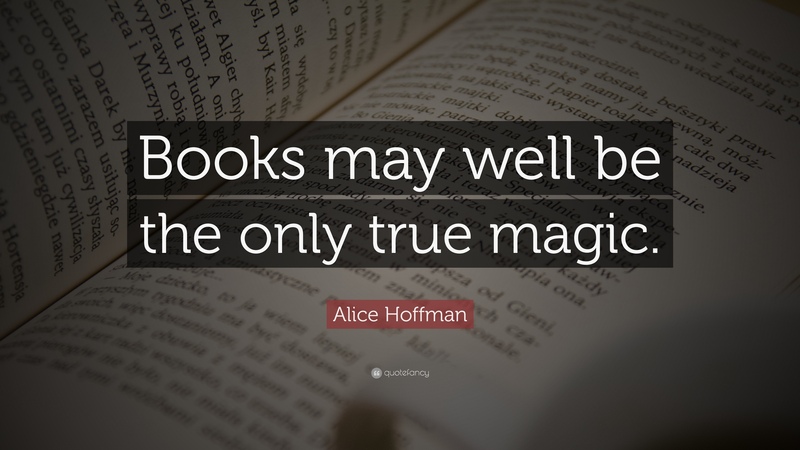 Find out more about Hoffman at http://alicehoffman.com/. “For what you can fix, there are a hundred remedies. For what cannot be cured, not even words will do.” (250). “Unable are the Loved to die, for Love is Immortality,” Jet said, quoting Emily Dickinson.” (240). “It helped to write things down. It ordered your thoughts and if you were lucky revealed feelings you didn’t know you had.” (318).